In a food processor, combine the garlic, rosemary and olive oil and process until the garlic is finely chopped. 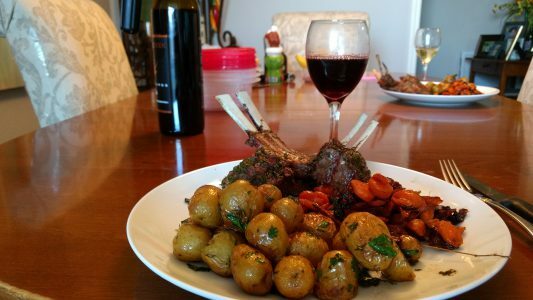 Season the lamb racks with salt and pepper and rub the garlic-rosemary oil all over them. Set the racks fat side up on a large rimmed baking sheet and let stand for 1 hour. Preheat the oven to 450°. Roast the lamb in the upper third of the oven for 15 minutes. Turn the racks and roast for 10 minutes longer for medium-rare meat. Transfer the racks to a carving board, stand them upright and let rest for 10 minutes.